For versatility, few conspiracy theories can match the one centering on behemoth inhabitants of ancient North America. The idea appeals to various stripes of neo-Nazis, fundamentalist Christians, Edgar Cayce devotees, alien visitation proponents, cryptozoologists, and the garden-variety conspiracy theorist. The idea that giants roamed the plains and hills was fairly popular in the era of circus freaks, sensationalist headlines, and hoaxes such as Piltdown Man and the Cardiff Giant. The reports purported the existence of a race or species of humanoid giants, usually advertised as eight to 12 feet tall, though some of the more daring made the 50 Foot Woman more than just a 1950s B Movie. The concept went mostly dormant in the mid-20th Century, but found new life when Jim Vieira presented his “findings” in a TED interview. The condensed Cliff’s Notes version is that scientists found massive skeletons in burial mounds in the 19th Century, but that the government ordered them destroyed, with the Smithsonian doing the bulk of the bone crushing. This assertion gained some traction in various subcultures, but exploded when TED, after realizing that several unscientific and unsubstantiated claims had been aired, pulled the interview. What had been a minor scrape became a full-on bloody gush for the conspiracy piranhas. Clearly, THEY had gotten to TED. For the more level-headed, there were practical reasons for a serious website to remove the interview. Vieria made several science errors, such as ascibing the lack of any present-day giant bones to them having not been mummified. In fact, skeletal preservation and mummification and separate processes. He also insinuated that stone had been carbon-dated, which is impossible. Further, he cited Mayan writings as proof of the giants, even though interpretation has revealed the writings to be of births, coronations, and wars. One accuracy was the locations cited. There are burial mounds through Ohio and farther east that were common in the 19th Century, and dozens of persons could be buried in the same mound. As to why long-deceased giants would be of concern to the modern-day federal government, that depends on which conspiracy theory subset one subscribes to. For the religious fundamentalists, behemoth bones mesh with Genesis 6:4, which references giants cavorting about Earth. This vindication of the Bible, combined with the hole it would punch in Darwinism, is too much for the evil secular worldly government to handle. In neo-Nazi lore, the red hair becomes blonde, the Asiatic giants become white, and they are examples of the supreme Aryan race, which our race-mixing government could never tolerate. Edgar Cayce devotees claim the unearthed skulls had horns, consistent with the mixing of man and animal that appeared to him in visions. UFO enthusiasts agree the creatures were hybrids, but of aliens and homo sapiens. For cryptozoologists, the bones are proof of Bigfoot or his ancestors. The most specific reason I found for the cover-up came from myteriousworld.com. It insists that Smithsonian executive John Wesley Powell worried the bones would distract from the plight of the American Indian, since people would no longer think they were the only ones who lost their land, or worse, than the Indians had slaughtered them. Today, “these countless crates of precious truth are lost in the massive Smithsonian Warehouse, guarded by security.” If mysteriousworld.com has any evidence for these theories, it failed to cite it. Besides the newspaper fabrications, circus displays, and hoaxes, the main evidence cited by believers is that North American Indian tribes had tales of slaying giants. In other words, the proof lies in variants of Jack and the Beanstalk. The proponents also concluded that the mounds were so large so that a giant could be buried there. The idea that they could instead be used to bury dozens of normal-sized persons is ignored. Despite the broad range inhabited by this sizable population of massive creatures, they were never referenced by Amerigo Vespucci, Henry Hudson, Francisco Coronado, Hernando de Soto, Sir Francis Drake, Ponce de Leon, or the Vikings. In a typical newspaper account of the time, the Fort Wayne Sentinel of Nov. 28, 1897, reported that the skulls of 100,000 giants with two rows of teeth apiece were found near Wichita. All of the bones are gone now. 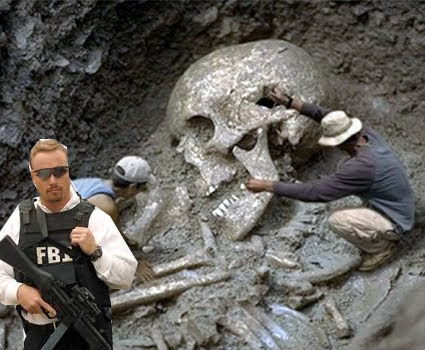 In fact, the conspiracy has been so thorough that every trace of the hundreds of thousands of giant skeletons has been excavated, moved, and destroyed or successfully hidden for decades. Try competing with that, Grassy Knoll.